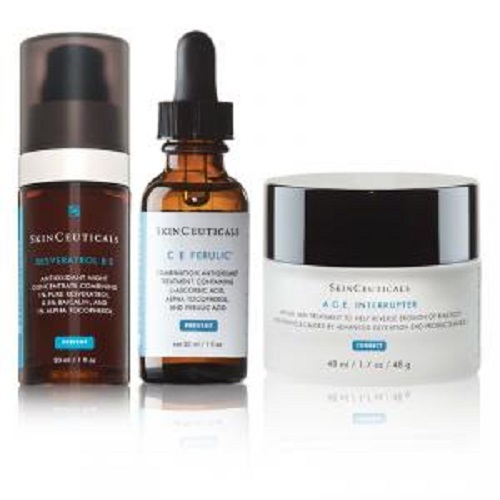 SkinCeuticals - ADVANCED ANTI-AGING SYSTEM corrects visible signs of aging while it promotes collagen production and protects skin against future damage. Vitamins C and E, as well as ferulic acid, fight free radicals while peptides restore a youthful complexion. This three-product regimen with best-in-class technologies diminishes the signs of accumulated damage for dramatic results – reduced wrinkles, increased luminosity, and restored density. This rejuvenating kit improves damaged, aging skin and features full-sized products. Active: Octinoxate 7.5%, Zinc Oxide 7%. Inactive:C E Ferulic: Water, Ethoxydiglycol, L-ascorbic Acid, Propylene Glycol, Glycerin, Laureth-23, Alpha Tocopherol, Phenoxyethanol, Triethanolamine, Ferulic Acid, Panthenol, Sodium Hyaluronate. A.G.E. Interrupter: Water, Prophylene Glycol, Dimethicone, Hydroxyprophyl, Tetrahydropyrantriol, Cyclohexasiloxane, Isohexadecane, Glycerin, Synthetic Wax, Dimethicone/PEG-10/15 Crosspolymer, Alluminum Starch Octenylsuccinate, Phenoxyethanol, Bismuth Oxychloride, Magnesium Sulfate, Salicyloyl Phytosphingosine, Acrylates Copolymer, Vaccinium Myrtillus Extract, Methylparaben, Ethylparaben, Disodium EDTA, Parfume/Fragrance, Butylphenyl Methylpropional, Coumarin, D28746/2. Resveratrol B E: Aqua / Water / Eau, Dimethicone, Propylene Glycol, Dipropylene Glycol, Niacinamide, Alcohol Denat., Glycerin, Caffeine, Sodium Chloride, Peg/ppg-18/18 Dimethicone, Tocopherol, Resveratrol, Scutellaria Baicalensis Extract / Scutellaria Baicalensis Root Extract, Disodium Edta.